For those that are real fans of the Disney Frozen character Olaf, you are going to love the Disney Frozen Olaf Waffle Maker. Waffles at our house are a family event. Everyone gets to help. When the kids were little, they loved to help me make them. Now it’s the grand kids. They pull up a chair and help me pour the batter and watch it carefully so it won’t burn. They are really careful about it being so hot too. I have to watch them closely, but they love helping so much, I can’t say no. Frozen movie. There is some assembly required because you have to put Olaf together once he baked. Can you just imagine all the funny positions your kids will have Olaf in? He would love it; especially if you had them on the beach. There are tons of waffle recipes, but I keep mine simple. Some weekends I even make the batter ahead of time so I don’t have to get up too early to have breakfast ready for the grand kids when they come to visit. This new Disney Frozen Olaf Waffle Maker is going to be a huge success in my house. Now I can’t wait for the grand kids to come visit again! 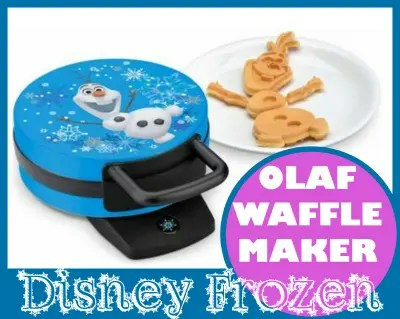 This Disney Frozen Olaf Waffle Maker will be a great surprise to everyone on Sunday morning or on any morning when waffles are on the breakfast menu.